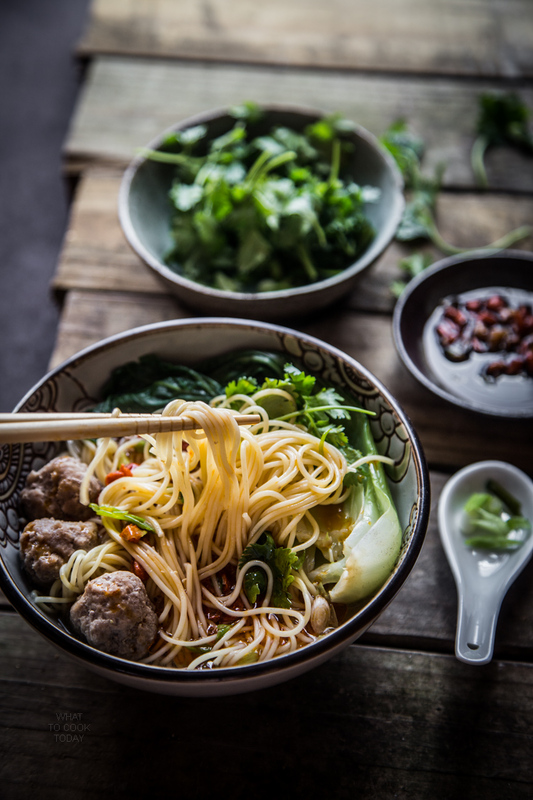 Easy Breezy Asian Pork Meatballs Noodle Soup – A comforting bowl of noodle served with bouncy meatballs and goji berry soup. Perfect easy everyday recipe and can be made ahead too. 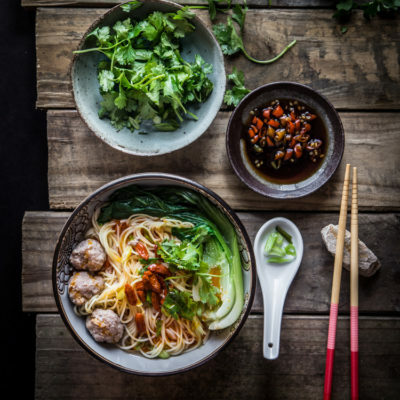 These Asian-style Pork meatballs were something my mom made often when we were kids. She likes to serve them in a noodle soup like this. My love for noodles definitely comes from my mom. My dad loved his rice. We have this term “rice bucket” in Chinese and he was definitely one ha..ha.. And now my daughter probably inherited this noodle craze from me 🙂 It doesn’t matter whether it rains, shines, or snows…I can eat noodle any time of the day, any day of the week. 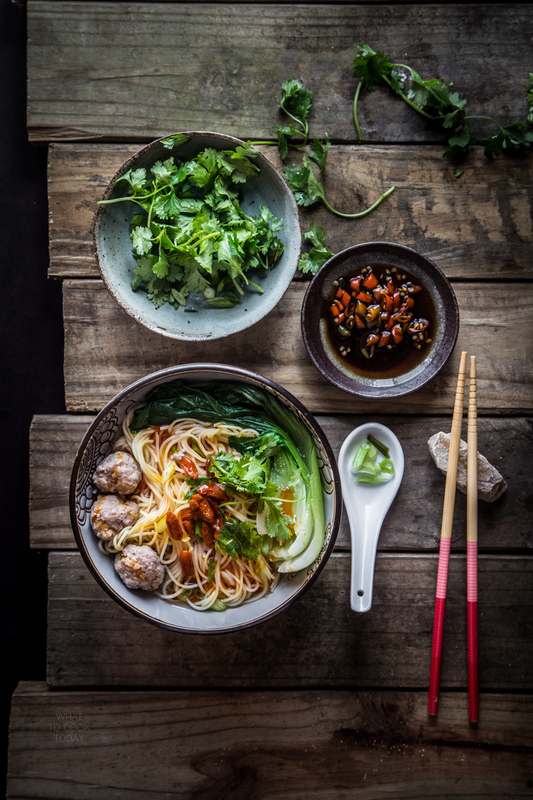 It’s not unusual for us to have noodle soup or stir-fried noodles 3 meals a day (yes, that includes breakfast) in Asia. Goji berries are commonly used in Chinese cooking, especially in soup. If you have never tried goji berries in a soup, you should. I love it. My 2-year old son obsessed with goji berries in soup. Try not to overcook them though, because if you do, you won’t taste the sweetness anymore. I love how they puff up in the soup. Sweet and soft. I usually pop them into the soup at the very end of cooking, as the hot soup will continue to soften the berries. CAN I CUSTOMIZE THE RECIPE? This is one of the noodles that can be “dressed” up or down as you wish. Sub the meatballs with shrimp or leftover chicken meat (shredded). Really…highly flexible. You can use other vegetables like sugar snap peas, yu choy, or even something like kimchi. They can be made spicy or not. I like to drizzle chili oil for that extra kick. You can freeze the cooked meatballs and when ready to serve them, just bring a pot of water to a boil and cook the frozen meatballs about 15-20 minutes, maybe a bit less if the meatballs aren't too big. Wow! Being a noodles freak myself I can totally understand your love for noodles! How can someone not love noodles! And if it looks as gorgeous as yours, then I can have it 6 times a day! No joke! 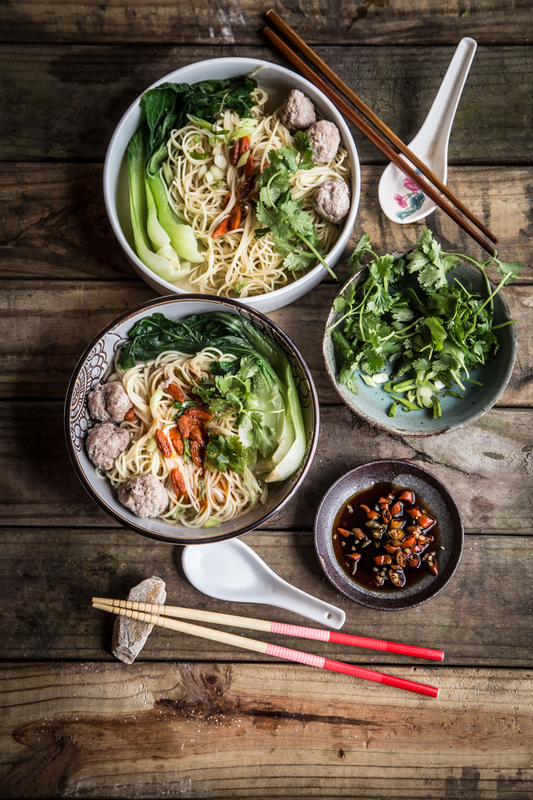 Do you have an idea on how long it takes to cook the meatballs in the broth? Just ball park figure. Hi Kristin, Sorry for leaving that information out. I’ve added it in the recipe. I would say between 5 to 10 minutes. I hope that helps! Your noodle soup looks delicious. I also have a noodle addiction. I even eat noodles much more frequently than rice. 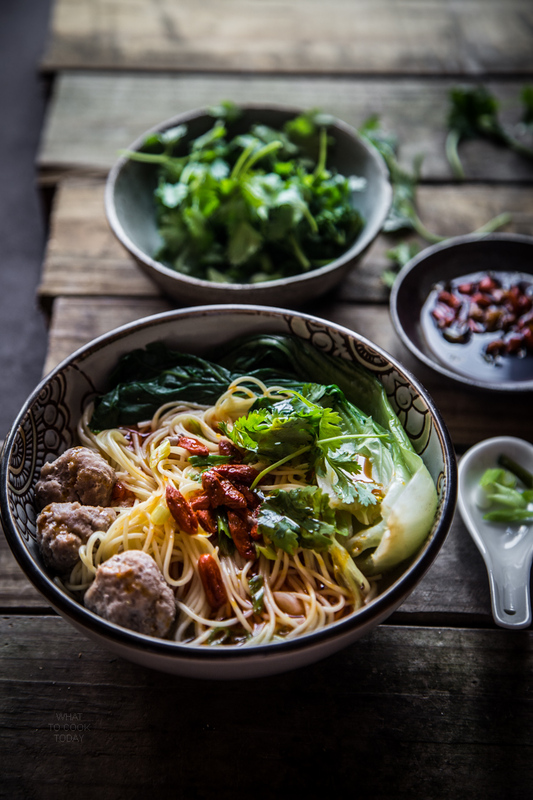 Using goji berries in savory dishes is not very strange to me, since in Vietnam we sometimes braise meat in Chinese herbal medicine including goji berries. However, I’ve never tried adding them to noodle soup. I will keep that in mind next time I cook noodles.